This is a section for those of you interested in beach stone crafts and art, some examples of which are: rock painting, beach jewelry making, pebble art. Here you will find lists of creative ideas, tips, advice, diy tutorials, for all sorts of lovely things you can make with beach stones. 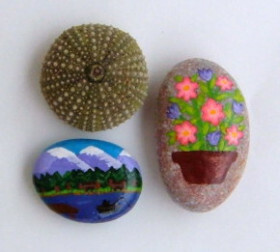 The beach stone crafts and art projects are for teenagers and adults, ranging from a beginner’s level to intermediate. They are mainly of the kind that serve a functional or decorative purpose. However, there are also ideas for other artful creations with beach rocks and pebbles, like making land art (or beach art). Although this website has a special section devoted to Kids Activities, you can easily adapt ideas from this section to create your own projects with rocks and pebbles (e.g. Ladybug Crafts and Angel Crafts) for children’s birthday parties, family gatherings, to make holiday art for your classroom or for school bazars. Art-and-crafts-business owners and craft designers, babysitters and other childcare workers, kids’ party entertainers and organizers, interior and exterior decorators, librarians and those of you who create after-school-enrichment activities, you may all find something of interest here and benefit from the ideas in this section. Begin wherever you like. But if you haven't done so yet, go to Beach Rocks Info and get some basic knowledge on beach rocks and pebbles first. It will help you learn to identify beach pebbles and decide what kind of beach stones you would like to incorporate into your craft and art projects. If you truly love beach pebbles you may argue that they are all amazing and inspiring in their own way, and you are right. However, not all pebbles are suitable for the same kind of beach stone crafts and artwork – size, color, shape, texture, hardness, must all be taken into consideration for a successful craft or art project. You can buy some special beach pebbles online for your crafts, as well as some exceptional ones for your jewelry art, or you can purchase cheap and more common sea pebbles and river pebbles at your local garden supplies store. The number and kind of tools and supplementary materials you will need depends on what you want to make. The style you prefer, the technique you are going to use, the receiver (if you intend to offer it as a gift), all play a role. For example, you can chose to make a pebble pendant with macramé strings, or a hand-painted one, or a wire-wrapped piece, or you can create a design which combines all these three materials. 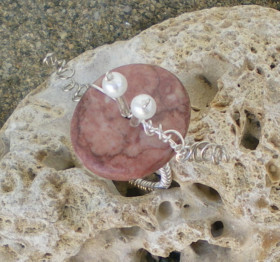 It also depends on the message you would like to convey through your beach stones crafts and artwork. E.g. you can decorate your beach pebble wall art with upcycled materials including plastic and fiberglass, or with natural materials without any plastic or fiberglass. 3. Space to work in and a surface to work on This could be space and a surface outdoors or indoors, depending on: how messy your project is going to be, how much space you need, whether you’re going to use spray or liquid substances you mustn’t inhale (I strongly recommend you avoid such products if there is an alternative solution), the kind of art you create (e.g. beach rock balancing is much more effective as artwork made and photographed on the beach than in any other location), etc. 4. Ideas for your artwork and crafts Where to look for ideas? First of all, click on all links of this website and you will get plenty of ideas. Other sources are: printed books and e-books, downloadable pdf tutorials, e-courses for making beach stone crafts and art, online or offline workshops, websites and blogs where you can see other people’s rock art and pebble art, related boards and pins on Pinterest. Never copy other people’s work - use it only for inspiration, to ignite the flame of the creative thinking process. a. Start with intention (know what you want to make and why). b. Focus on whatever it is you are creating. Put your heart in it. c. Experiment and learn from your mistakes. d. Listen carefully when people talk about your handcrafted creations. e. Find alternative solutions, if it is not working. Don’t give up. f. Be proud of your efforts, progress and achievements (even the smallest). g. Share what you learn in the process, as well as your results, with the world (on your blog or a social media platform). There is something in the appearance and the texture of beach stones and pebbles that calls for the inner artist that exists in all of us. Perhaps it is the primitive calling of mother earth and the mental peace that follows our answering it. Use beach rocks and pebbles for your crafts and art projects and you will soon find beach pebbles and beach stones occupying a good place in your home, your head and your heart. Make these beach stone crafts either for yourself, or to offer as gifts of kindness and appreciation to friends, colleagues, neighbors, teachers, family members and spread the love for beach rocks and pebbles. Explore your imagination, use creative thinking, feel free to go wild with your designs and adaptations. Then, expand on these beach stone crafts and art ideas by organizing, or supporting, creative activities for the less privileged members in your community and the elderly.